My focus is on capturing those heart connections of your family, in a fun and playful way. You can expect your session to last approx 2 hours. This allows for time to change clothing, take feeding breaks, and taking poses. Plan to arrive at the studio approx 15 min prior to your time slot to allow for parking and getting settled. I schedule my clients with enough time that we do not ever feel rushed. So come ready to relax and create some wonderful memories! 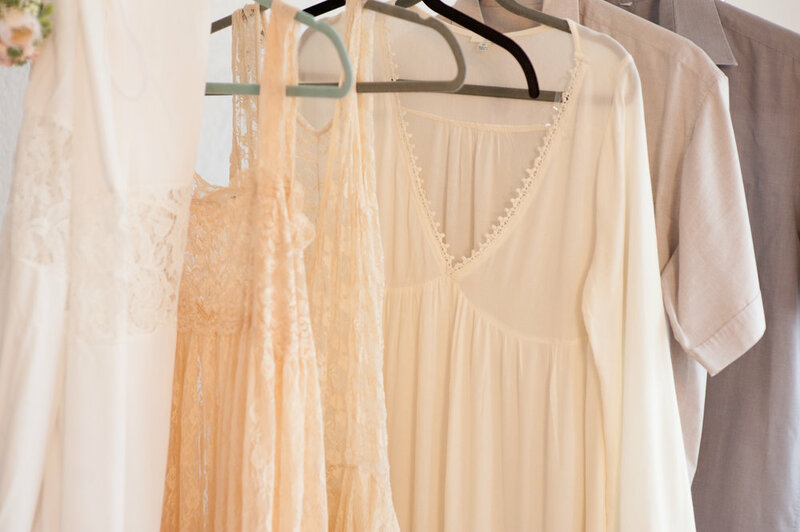 Your session includes access to our studio wardrobe. I will have everything ready for you, the baby and anyone else in your family. The colors are whites, creams and neutral tones. Earthy, Organic props. MAMA: All you need to do is your hair and make up. If you would like someone to do this for you, I do have a stylist I recommend. you can click the link below to book. I highly encourage all mom’s to have their hair and make up done professionally. Boys, come as you are, i have your clothing. BABY: The baby will be in just a diaper for most of their portraits with beautiful cotton adornments and blankets to cover him/her up. My focus is on the newness, such as all the details of hands and feet and heart connections for your session. I do not use props other than blankets and hats. My style is simple and organic in nature. Siblings- siblings together with baby, youngest sibling with baby. Family: Entire family unit 1 group portrait. Grandparents - I do not charge extra for grandparents to be part of the session. Its an incredible blessing to have them here so far away from home and investing in their family legacy. Poses include - grandparents together with newborn, and each grandparent with the newborn. Please schedule and additional 20 min for them. You can park on the street or if the school across the way is closed, you can park in their parking lot. Simply come in the gate and walk straight back to the left of the house. Our door is on the right! We provide a changing space for the baby, supplies, as well as snacks and drinks for all. There is a comfortable space for nursing the baby, as well as space heaters and reg heaters to be nice and warm in the cooler months. After your session, we meet back at the studio for your ordering appointment within 2 weeks of your session date. This is where you see your images and order your collection and any additional products (album, canvas, framed prints etc). We ask that anyone involved in making the purchase attend this appointment. We have a play space for younger children who are most welcome to attend! Does anyone in your family attending the session have any allergies we should be aware of during the time at our studio? If you have other children, please include their names and ages. Will hubby be able to stay the entire session, or will he need to head back to work? I make a priority to shoot dad first if he needs to leave, since i know this can be a busy time for most dads.